In 1996 Division 12 of the APA presented Centennial Awards to two psychologists who were considered to have made the greatest lifetime contributions to the discipline. One of those individuals was Paul Meehl. Dr. Meehl's writings on research methodology and mental illness influenced generations of researchers and psychotherapists. 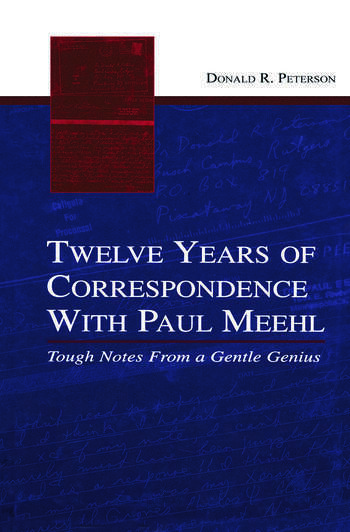 Twelve Years of Correspondence With Paul Meehl is composed mainly of letters between Drs. Paul Meehl and Donald Peterson during the final 12 years of Meehl's life. After Meehl's death, Dr. Peterson revisited their correspondence, and found a remarkable order in it. One topic flowed into another. With some connective, explanatory text, the letters shaped themselves into a book. The correspondence forms a story of the relationship between an extraordinary mentor and his student, as well as a dialogue between two eminent psychologists. The letters explore penetrating questions, and underlying arguments, about some of the most recalcitrant issues that scientists and practitioners encounter in their efforts to understand the human condition. Paul Meehl contributed notably to seven areas: philosophy of science, learning, schizophrenia, clinical and research training, personality assessment, taxometrics, and clinical versus statistical prediction. The letters touch on each of these areas and examine some issues more thoroughly than either Meehl or Peterson had done in any other writings. The book includes an extensive set of endnotes that identify the many works that are referred to in the letters as well as explanatory comments. This intimate look at Paul Meehl's way of thinking will appeal to graduate students and professionals in such diverse fields as psychology, psychiatry, biology, sociology, law, education, and philosophy. Contents: Introduction. Meekl. Hermeneutics. Kudos and Confusions. Prizewinners, Perils, and Parapraxes. Morality. Peterson's Sermon. Meehl's Response to Campbell. Selling an Unpopular Book. Discovery and Justification. Constructionism, Realism, and Intellectual Honesty. Reconciling Differences. Social Experience and Social Conscience. Meehl's Constructionism. Politics and Politicians; Psychotherapy and Psychotherapists; Paleontology and Paleontologists. Factor Analysis. History and Historians. The Scientific Mentality. Meehl's Scientism. Farewell.